This March was started in 2005 in celebration of the 75th anniversary of the famous Dandi March in India when defying the Salt Tax millions of Indians led by Mahatma Gandhi marched to the seashore of Dandi and made their own salt, bringing the British Empire to its knees. The march was also a commemoration of the 50th anniversary of South Africa’s Freedom Charter. The T-shirts are designed to include Gandhi and Luthuli depicting the two anniversaries. One of the features of this march has been that it has always been led by the SANDF or the SAPS brass band to affirm the spirit of nonviolence. The 2016 march was our 12th Salt March. Since 2005 for many years the march commenced at Phoenix Settlement and ended in Durban. It was a fairly long walk, 22 Km, to 17.5 Km depending on where the finishing point was. But because it is not a competitive walk, people were able to get on to buses that followed us, when tired. The spirit of the march, starting at the Phoenix Settlement brought us close to Mahatma Gandhi and was indeed a unique experience. Many enjoyed the experience of visiting the tranquil Settlement early in the morning and feeling the peaceful nature of the place. Social cohesion, peace, nonviolence and a spirit of oneness with each other and the universe is promoted in these annual marches. Because of road works and lack of a younger group of Marshalls to ensure that the marchers are in no way endangered by passing traffic, walking alone or just recklessness in crossing the roads, the march had to be moved to the beach front and the distance drastically cut to 5 Km. Many former marchers became disenchanted by the move and no longer participate but new comers have joined in. 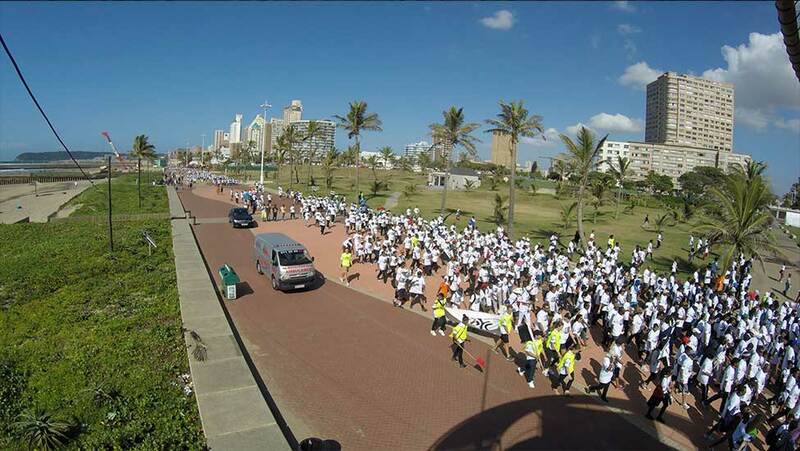 The 2016 Salt March took place at the Durban beach front. This route is along Durban’s scenic golden mile starting at the beautifully tranquil Amphitheatre proceeding to uShaka marine world and returning to the amphitheatre. The event was attended by 800 participants. We had many prominent people joining the march including the Consul General of India, The MEC for Public Works and Human Settlements and others. There was a noticeable interest in the march by the hundreds of tourists and other people on this popular promenade. The walkers carried banners that gave clear messages of nonviolence, social cohesion and gender consciousness.